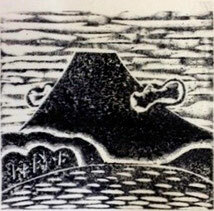 I tried to make the work "fujiyama" of a simple one- colored printing. This is making using the taste of the veiner, the gouge, the flat chisel. Also, I tried to finished work by two types of hand-coloring. I drew picture on a sketchbook with 6B pencil. Let's plan how to use chisel while drawing a picture. Directly transferred to the woodblock / Over-painting　"Sumiire"
I put reversed picture on the woodblock and transfered to woodblock by rubbing it with a spoon.Transcribed picture in woodblock is light visibility. Let's clear it by painting black pigment. This is "Sumiire". At this stage, I recommend that you make the Kento. 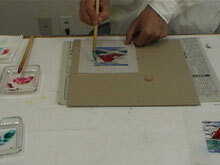 Even though one-block printing, you can print it many times by Kento,When you want the light and shade in the work. The sky, cloud, Mt. Fuji, a forest and a lake are in the picture. Which chisel should I use? I decided to carve that sky and cloud using flat chisel, trees of forest using veiner, lake using gouge. In addition, I decided to do block-gradation "Itabokasi" with a flat chisel as for the border of Mount Fuji and the forest and the cloud. 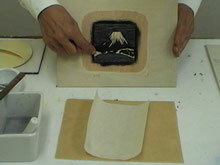 Carving of block-gradation"Itabokasi" is carved(shaved) to make a gentle slope. It is like carving of "Kento". 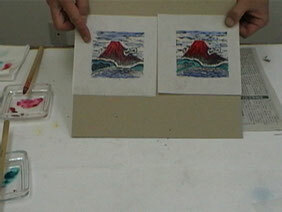 As the left image, I carved some top of "Fujiyama" for hand-coloring. In the case of back(behind) hand-coloring, it's printed using "Mino paper" or thin washi-paper below 7 momme. This back(behind) hand-coloring seen many works of Shiko-Munakata. As the right image, left is back(behind) hand-coloring, right is front hand-coloring. Back(behind) hand-coloring sickly feeling hue.